Thanks for downloading Noise Blocker. Problems downloading? Click here to try again. Below is all the infomation you'll need to fully configure Noise Blocker. Noise Blocker needs to know which microphone to use. Check the selected Input Device and change accordingly. 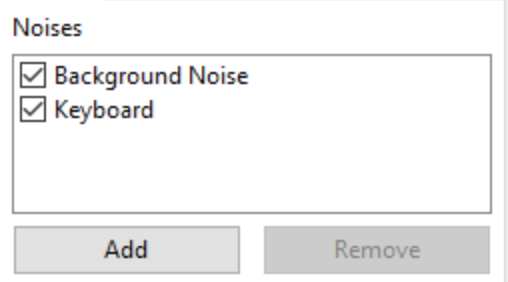 To filter out noises, Noise Blocker needs you to record a sample of the noise. Click on Add and follow the instruction to record and label a noise. For best results, it's often useful to start out by recording just the microphone's background noise. Record isolated noises one at a time, e.g. one for keyboard noise, one for mouse clicks, etc. 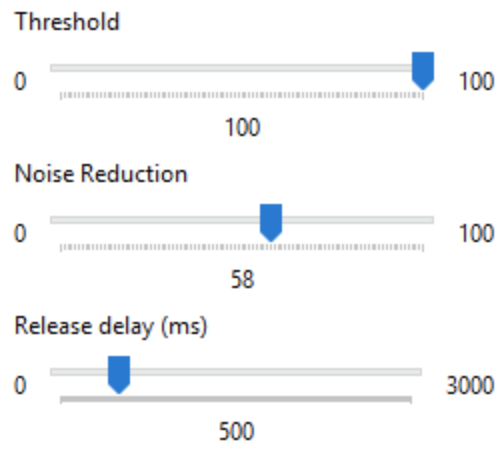 You can fine-tune Noise Blocker to work for your setup and environment. When the filtered audio's volume level goes above this, Noise Blocker will allow audio through. It's not unusual for this to be set to 0. Control's the amount of supression applied to the unfiltered incoming audio. The higher this is set, the greater the amount of noise reduction applied. If you find your voice is being cut out, try lowering this setting gradually. If you find noises are still coming through, try increasing this setting gradually. How long (in milliseconds) the microphone should stay on after the volume has dropped below the threshold. Finally, you'll need to configure any application to use Noise Blocker's virtual microphone. The virtual microphone is the filtered audio. Typically this mean's selecting "Microphone (Noise Blocker Virtual Audio Device (Wave Extensible) (WDM))" in your application (Skype, Discord, Google Hangout, etc) of choice. In trial mode, Noise Blocker is limited to a daily usage of 1 hour. If you would like to remove this restriction, please consider purchasing a life-time single user license. Purchases greatly aid the development and maintenance of the application. If you are running into issues, or have a specific question not answered above, email support@closedlooplabs.com and we'll do our best to assist. Copyright © Closed Loop Labs Ltd. All rights reserved.